President Barack Obama continues to make history, even if it has nothing to do with his political campaign, by becoming the first president to attend a WNBA game. 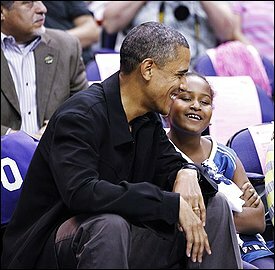 Mr. President attended a game between the hometown Washington Mystics and the Tulsa Shock. All of the WNBA haters out there will be happy to know that the first shot of the game was airballed. Sasha Obama accompanied her father, sporting an Alana Beard Mystics jersey. We know the president has some basketball skills of his own, maybe his daughter is the future of the WNBA. Obama has still yet to attend a game of the NHL’s Washington Capitals, the city’s most successful franchise, to the dismay of the D.C. residents. I would be surprised if he doesn’t make an appearance during the upcoming season. On Wednesday Team USA advanced in the World Cup after a critical rally, capped by a Landon Donovan goal during the first minute of stoppage time. Former president Bill Clinton was in South Africa for the game and predictably met with the team after the game, although he interacted with them more aggressively than you might imagine. There’s nothing like crackin’ open a Budweiser with a former President of the United States of America, but judging from that picture Mr. Clinton has already downed a few. The shirtless man is US defender Carlos Bocanegra. President Obama called Team USA to congratulate them on their victory and wish them good luck in the upcoming match against Ghana. Thankfully, no beers were chugged on his end during the encounter.